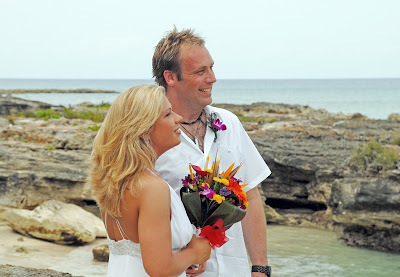 Cruise Wedding at "My Secret Cove"
Last week I did a lovely wedding for a couple from Guelph, Ontario. It was the hottest day of the year so far, but we had a lot of fun anyway. Fevi got us to climb up on these rocks, and it was a good thing I was dressed for travelling in slacks, or I wouldn't have made it. I know she got some impressive shots, and I have been dying to see them. I met the couple at 8 am when they got off their cruise ship and did their documentation for their Special Marriage License, then rushed off to the "Glass House" to pick up their license, and load up the blue "granny-mobile" with all my stuff, table, linens, flowers and champagne! By 10 am it was all underway, and by 10:30 am I was at the General Registry (Public Records Office) where I filed their marriage certificate. Then it was off to the airport, as S and I were going on a little trip. Sometimes I think I will start another blog about our monthly travelling adventures. In the meantime our Canadian love-birds enjoyed getting wet and cooling off in the surf. I love it when couples so obviously enjoy their wedding day. 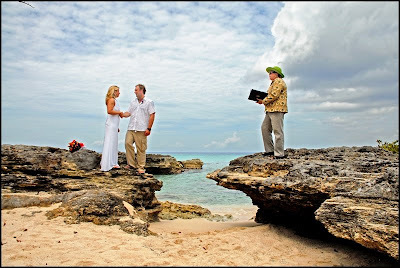 After all, your day should be filled with joy, and if you get to do something a little different, well then my avowed intention of creating a very special memory of the Cayman Islands has been fulfilled. I wanted to share this wedding because so many people write and say they want a "simple" wedding, but they also want it to be stress-free and fun. 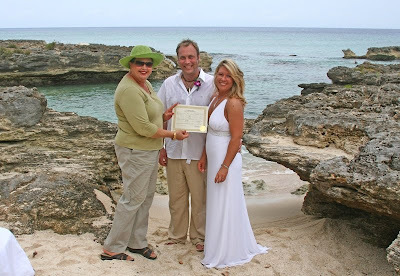 I want it to be stress-free and fun for me too, as you will know I am retired (from real work) so doing weddings is something I do because it makes me happy (ier) and gives my couples good memories of a special place where I am privileged to live...the Cayman Islands. as you want, answers are free and I don't mind if you comparison shop. Remember I only do one cruise wedding per day, so book early.